I’d Love to Visit Your School! Program: Writing: A Great Way to Work Out Your Stuff! Writing from real life: students learn how to recognize the “material” they have in their own lives—and how to use it to write narrative, expository, poetry, drama—any mode of writing that tells the story that is dying to get out. Q & A (Ask Me Anything! ), book signings, and talk with students after the presentation. Honorarium: $750-$1200 per day: all day: 8 AM – 4 PM. (As many presentations as can take place during that time.) OK to split between schools. Books must be available for purchase. *Daily fee does not include travel expenses: flight, hotel if more than 4 hours from my home. NOTE: I have a special place in my heart for Title 1 schools. TALK TO ME before you decide that this is not a do-able situation. I am an author of gritty YA fiction as well as an experienced (nearly 2 decades) English teacher. I currently teach English I, Pre-AP English, and Remedial English Lab classes in a small rural district in Henderson County, TX. I specialize in working with struggling learners from low socio-economic backgrounds. While I now teach the general-ed population, I taught Dual Language ESL classes for 8 years, transitioning kids from reading/writing Spanish to doing so in English, so I have a special understanding of the challenges English Language Learners face. My book, Hope in Patience, was named to the 2011 YALSA Quick Picks for Reluctant Readers, and another of my books, Big Fat Disaster, is on the Spirit of Texas-High School Reading List for 2015-2016. 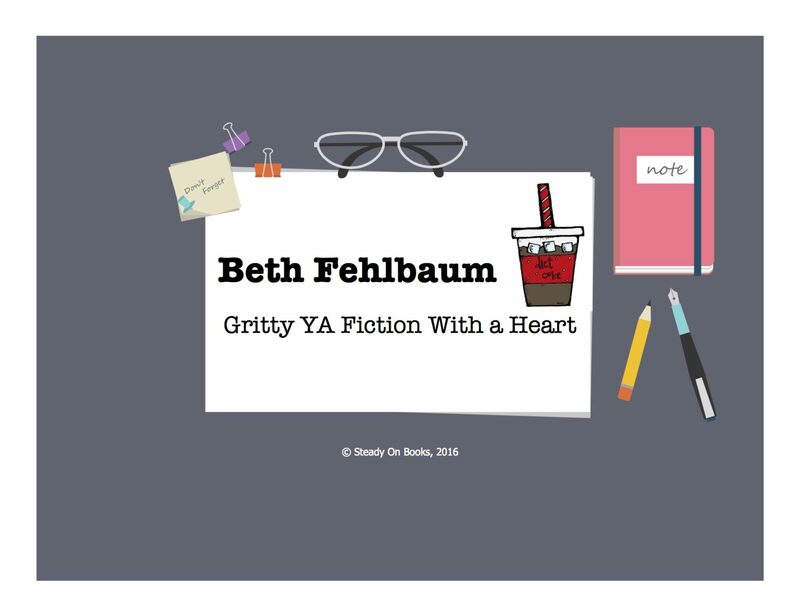 Chapter previews of all my books are available on my website, http://bethfehlbaumbooks.info . You will find a list of the events I have presented programs for, below. While I am thrilled to read from my work in conjunction with my visit–and in connection with the program I present–I know that the educational component of hosting an author is important, and I want to be there for you to support your efforts to improve your students’ mastery of writing. I am happy to provide a lesson plan that is correlated to your state’s standards. I write edgy YA fiction; thus far, my four books have dealt with Childhood Sexual Abuse (CSA) and/or Binge Eating Disorder. However, my objective of a visit is to discuss the concept of writing from one’s own experiences in a way that supports the objective of writing improvement and brainstorming. In other words, I will not be presenting a seminar on Childhood Sexual Abuse– unless you want me to do that. (Hope that eases your minds, LOL). I love attending bookfests, and that includes prepping ahead of time for panel discussions. I am very interested in combining school visits with attending your bookfest. I am willing to present writing workshops in addition to answering questions about my work. As a teacher myself, I am all too aware to the financial constraints schools and libraries operate under. That’s why I try to work with interested parties so that their students have the opportunity to meet an author whose book(s) they read. I am available on a limited basis during the school year since I have ninth graders to teach, but I do take time off for events that are well-planned and have an enthusiastic audience. In addition, I am happy to do Skype/Google Hangout visits. 1. If I’m flying to your location, I must have my expenses covered: that means airfare and hotel. 2. If I’m driving more than 50 miles to your location, I must be reimbursed for fuel. 3. I expect students to be familiar with my work. I am happy to partner with a local bookstore to do signings as a fundraiser for you. In addition to covering my travel, I have a $750-$1200/day appearance fee that is negotiable based on your situation. Please contact me before you decide there’s no way you can swing the fee and/or travel expenses. Let’s talk and figure out a solution. The fee for 1/2 day is $375-$600.00. I prefer to talk to groups of no more than 30 students at a time; however, I will work with you to give you as much “bang for your buck” as possible. As stated earlier: I’m a teacher. I get where you are coming from. Trust me. PLEASE NOTE: With very few exceptions, I do not sell my own books: I do not haul a box of books to your location. I suggest that you partner with a local bookstore–an independent one, preferably–to make my books available for purchase. Compared to many other mid-list authors, I charge much less to do school visits. However, the trade-off is that your students are well-acquainted with my work and my books are available to buy. Most bookstores will happily do on-site sales for you. Book Festival Coordinators: While I am willing to appear to speak at your event, I do not attend events that require paying for a table and selling my own books. Please keep that in mind before contacting me. Feb. 17, 2018 Teen Bookfest by the Bay! October 14: Border Book Bash! Missouri SCBWI Conference, St. Louis, MO: Panelist with Jo Knowles, Deborah Heiligman, Selene Castrovilla, and Shannon Delany. YALSA/ALA Annual Conference, St. Louis, MO: Panelist with Jo Knowles, Deborah Heiligman, Selene Castrovilla, and Shannon Delany.